Detail from Federal engineers map in the National Archives, dated January 1865, showing the vicinity of Globe Tavern. Two bastioned forts -- Wadsworth and Dushane -- protected the Weldon Railroad. 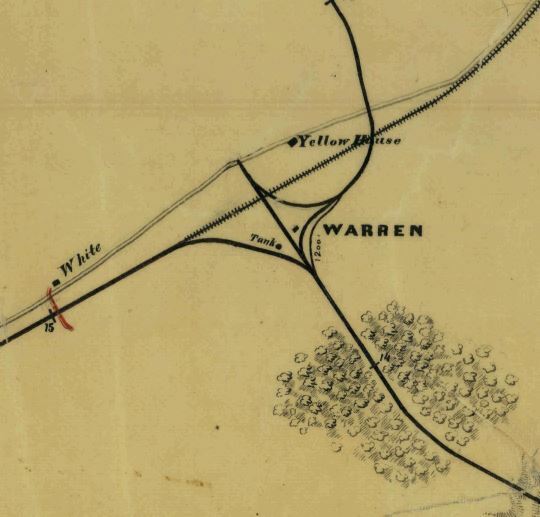 Detail of the 'Y' junction at the Yellow House, Globe Tavern, or Warren Station, from Map of the City Point and Army Line. NARA RG77 Rds. 196. This map shows "Yellow House" opposite the railroad from "Globe Tavern" on the right. 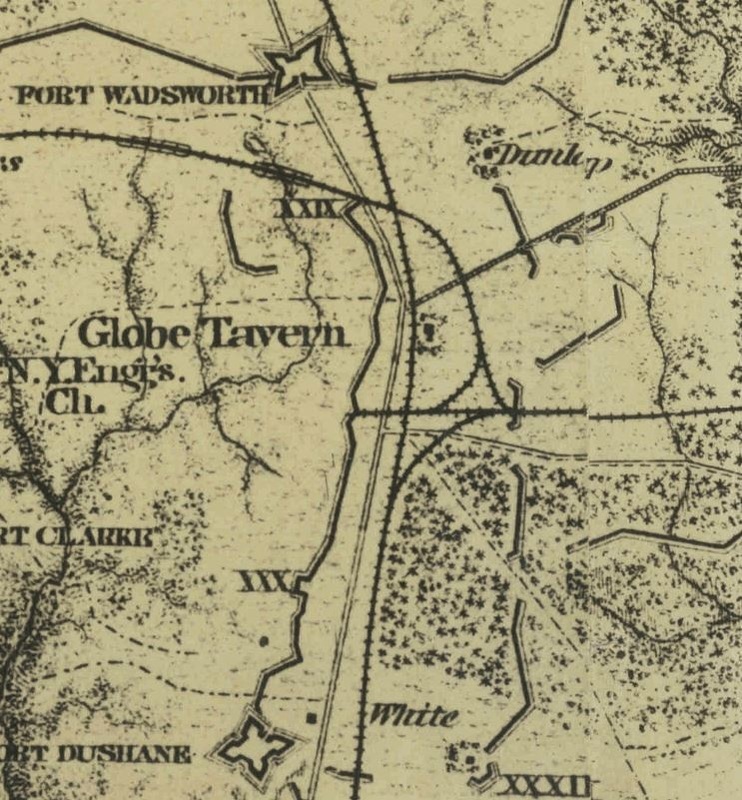 Detail of the Vicinity of Globe Tavern from the Michler map series, Sheet No. 11, 2" = 1 mile. Illustration from Under the Maltese Cross: Antietam to Appomattox, Campaigns 155th Pennsylvania Regiment (Pittsburg, PA, 1910), 318. 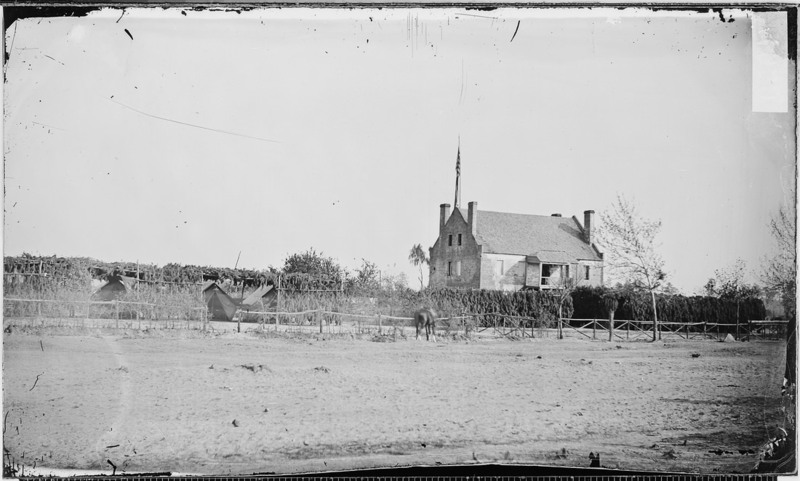 This, however, does not appear to be the same house shown in the images below. 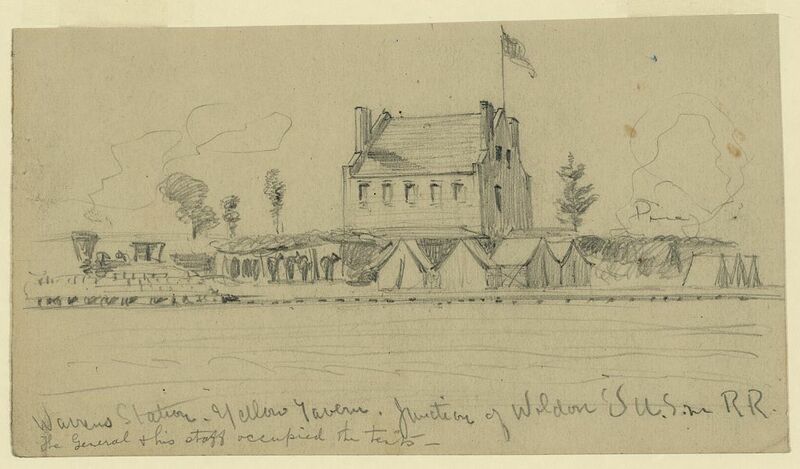 Two sketches of "Yellow House, Aug 19, Warrens HdQrs," by Charles Wellington Reed. From "A Grand and Terrible Dramma," edited by Eric Campbell. "Warrens Station. Yellow Tavern. Junction of Weldon's U.S. R.R.," drawing by A. W. Warren. 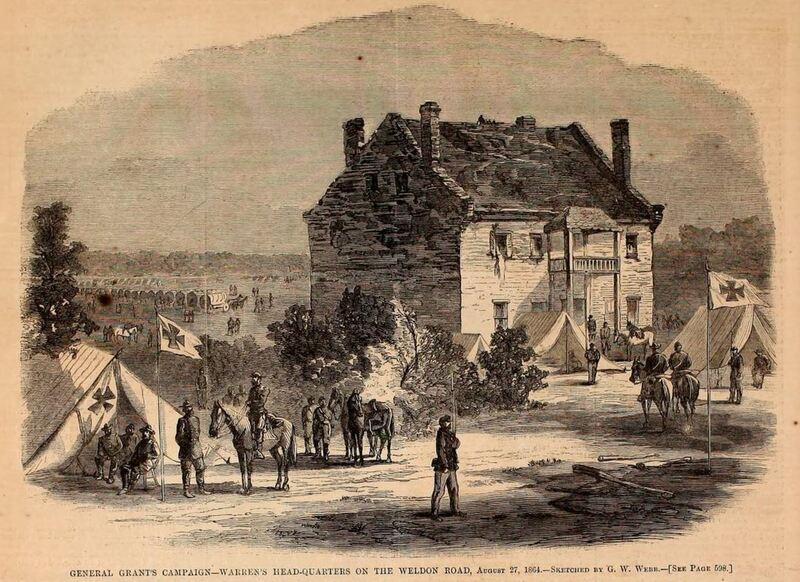 "Warren's Headquarters on the Weldon Road, August 27, 1864" sketched by G. W. Webb, "a soldier in the Fifth Corps." Woodcut published in Harper's Weekly, September 17, 1864. 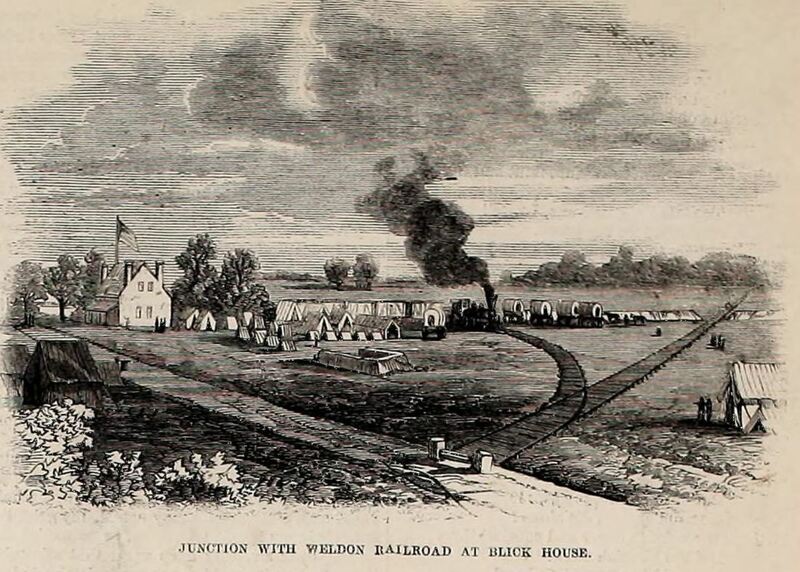 "Junction with Weldon Railroad at Blick House," woodcut in Frank Leslie's Illustrated, Oct. 1, 1864, from a sketch by Andrew McCallum. LC 33026. 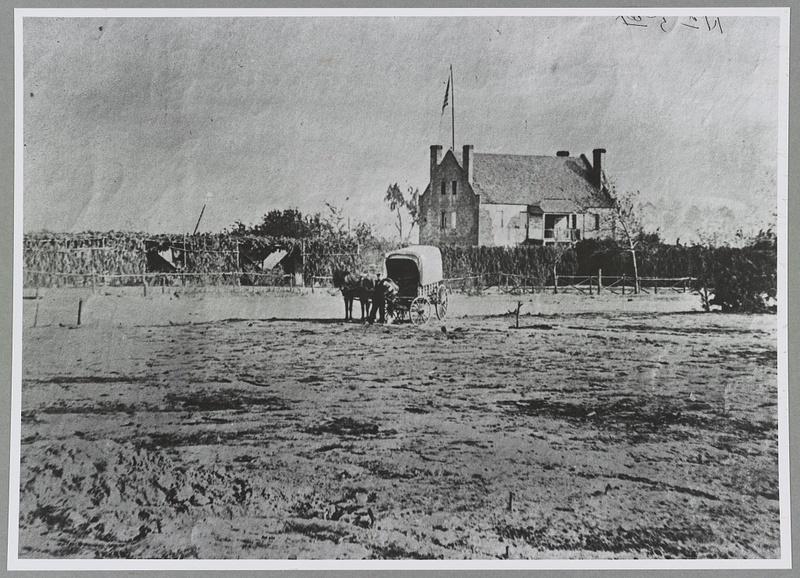 Original caption reads: "Globe Tavern - Meade's hdq. at the battle of Malvern Hill," which is erroneous. LC 35108. 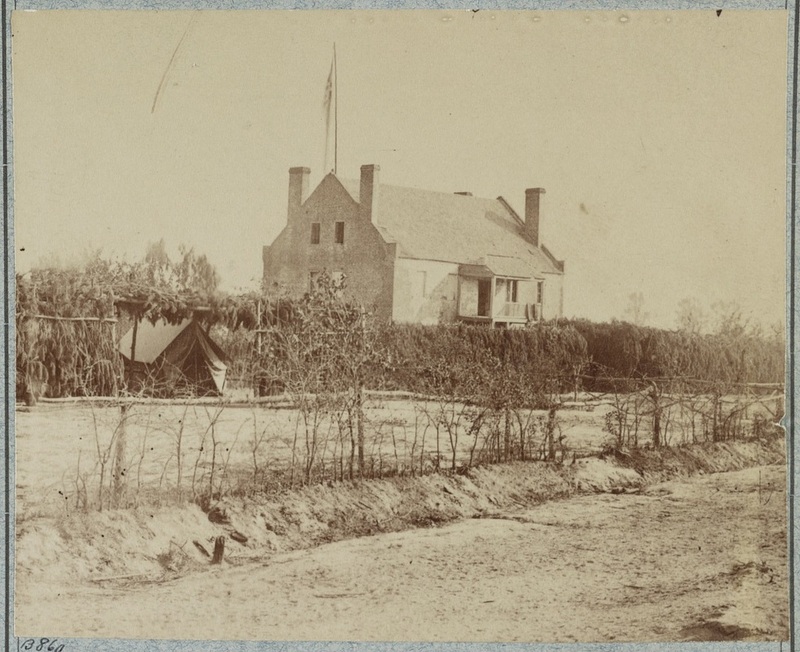 Caption reads "[Headquarters, 6th Army Corps, Warren Station, in front of Petersburg, Va.]"
LC 08263. 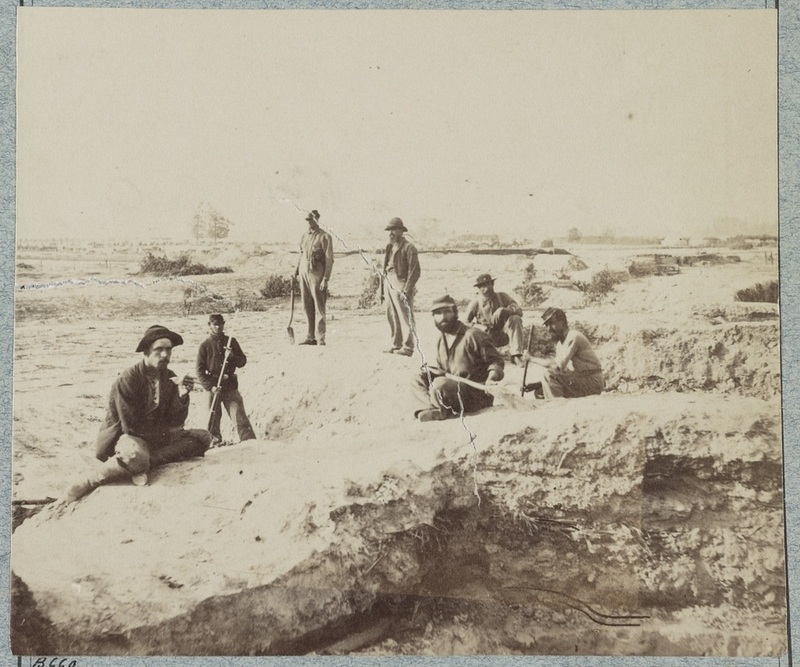 "View of "Y" on the City Point & Army line, near yellow house." Are those freshly dug graves on the right? LC 33015. "Headquarters 6th Army Corps. Warren Station, in front of Petersburg, Va." At the 'Y' junction. LC 32928. 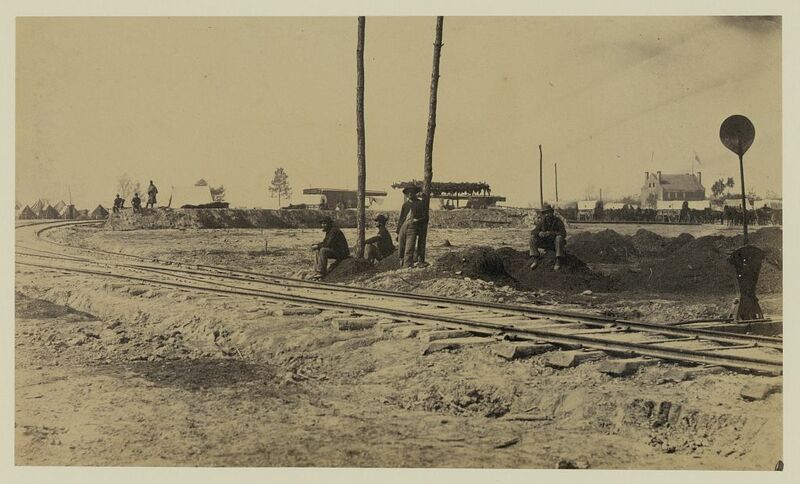 "Lone graves at Warren Station in front of Petersburg, Va.," photographer unknown. The covered wagon in rear is stenciled HEAD QUARTERS over a Maltese cross. 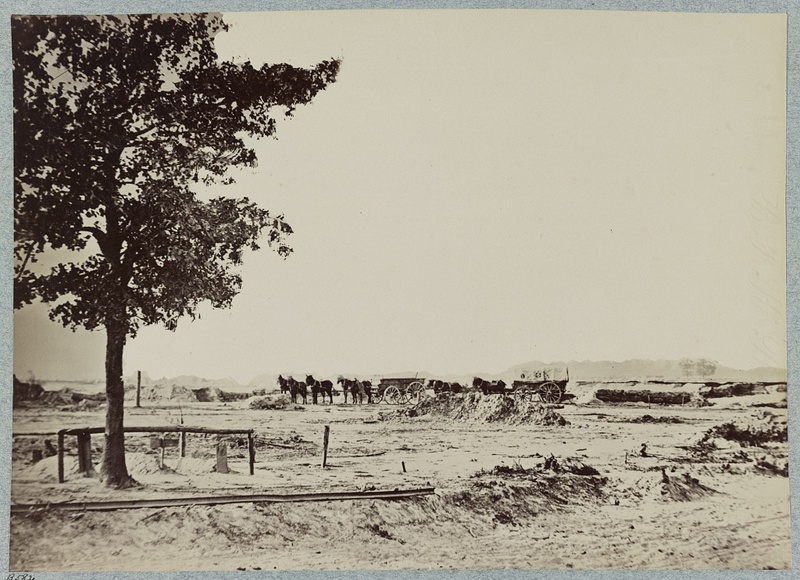 To the right of the wagon is the same battery that appears behind the soldiers below. LC 32410. Caption reads. 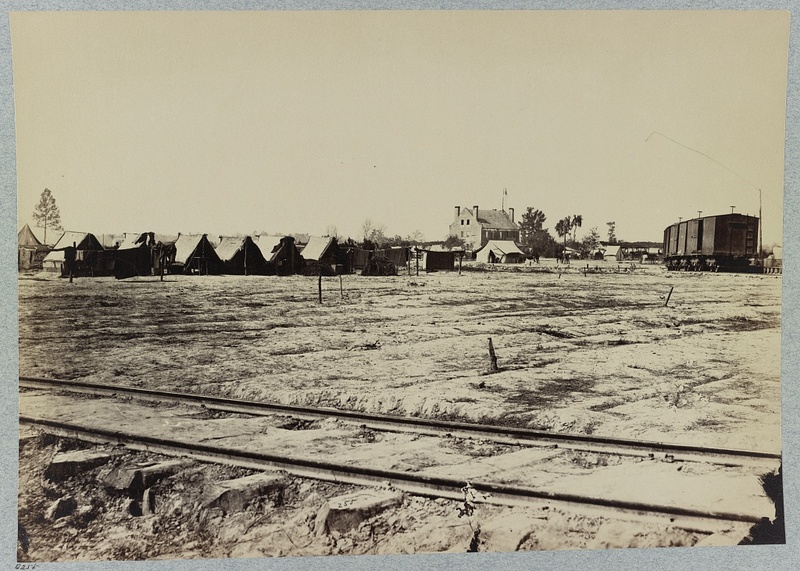 "Confederate fortifications at Warren Station." LC21009. 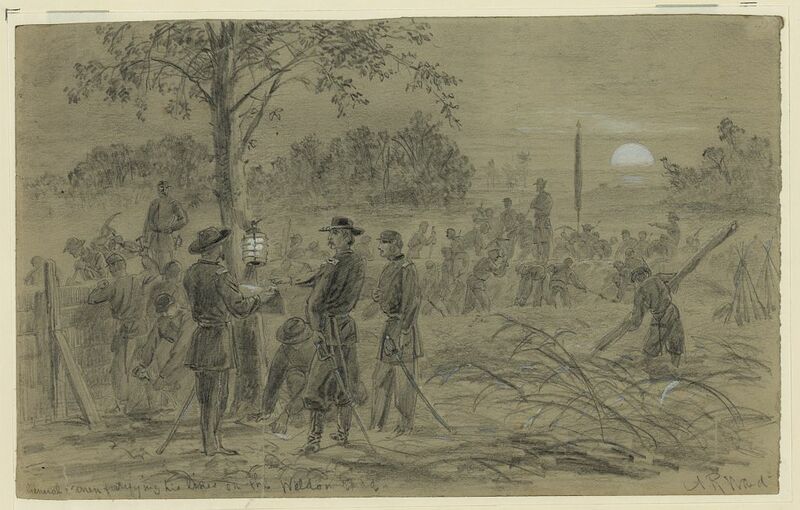 "General Warren fortifying his lines on the Weldon road," drawing by Alfred R. Waud. 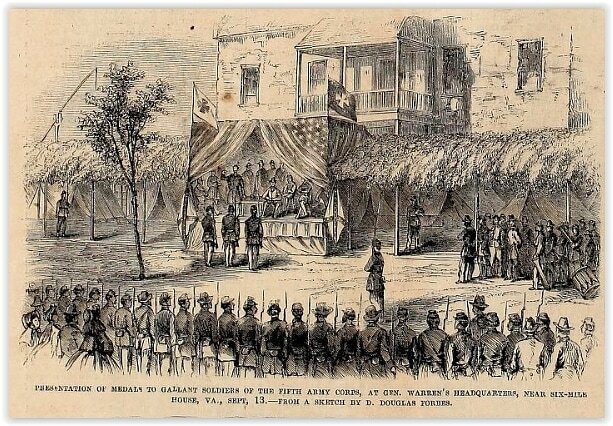 "The 5th and 9th Army Corps in Possession of the Weldon Railroad," woodcut published in Frank Leslie's Illustrated, Sept. 24, 1864, from a sketch by Edward Mullen. "View of Grant's Position on the Weldon Railroad," woodcut from Frank Leslie's Illustrated, Oct. 1, 1864, from a sketch by Andrew McCallum.